Maple Bacon Wrapped Brussels Sprouts - Delicious Appetizer Bite! Maple Bacon Wrapped Brussels Sprouts - Delicious Appetizer Bite! 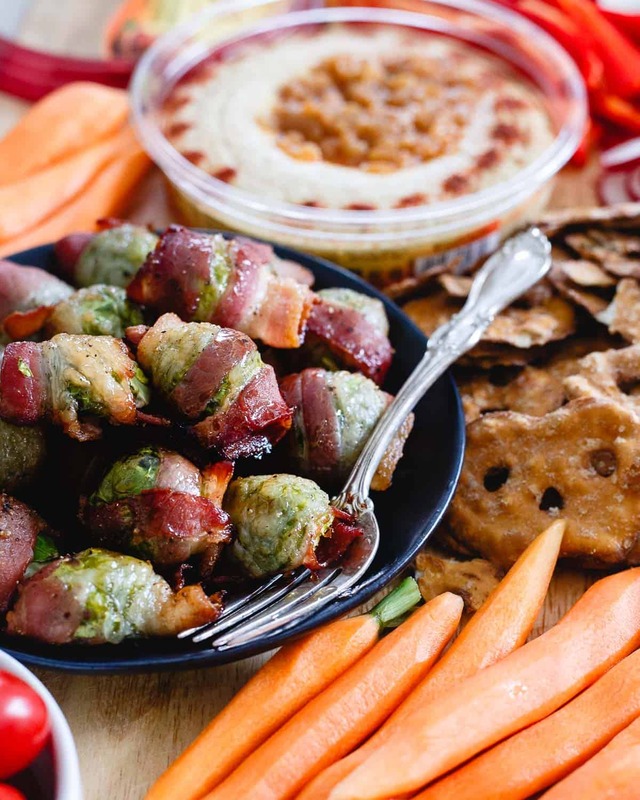 Home » Recipes » Appetizers » Maple Bacon Wrapped Brussels Sprouts + Super Bowl Spread! These bacon wrapped brussels sprouts are glazed with maple syrup for a salty, sweet bite. 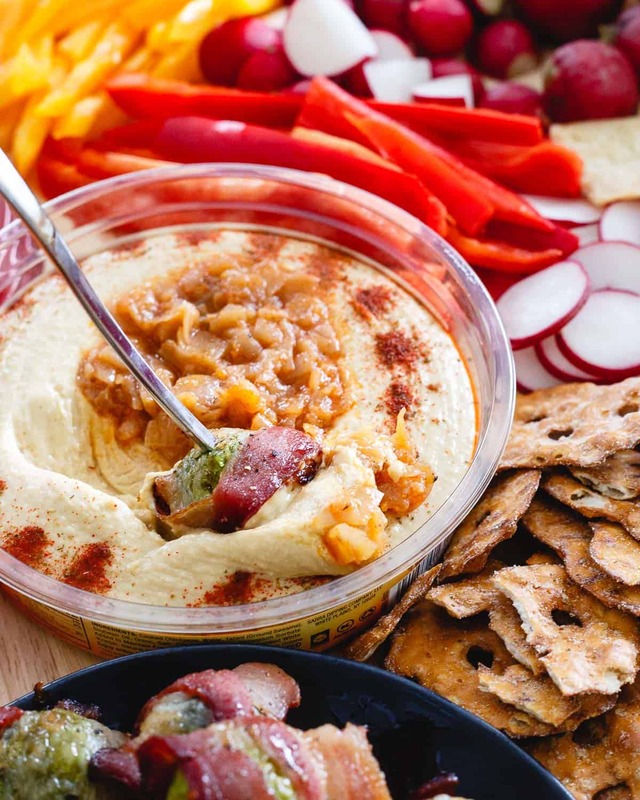 Serve them for game-day with a spread of hummus, vegetables and other dippers! It seems like every year at this time I get on this thing (aka my website) and rant about my hatred of football as everyone gears up for the the Super Bowl. Year 1 I made edamame dip and you got the first glimpse into my intense dislike of the sport. Year 3, I made this BBQ black bean tortilla pizza and bitched about the term “man food” that seems to go hand in hand with football. Year 5, with this awesome recipe for buffalo hummus chicken waffle bites (still one of my favorite ‘game-day’ foods) I had escaped to Mexico for the big event but still somehow found myself at a swim-up bar with American football playing in the background. Ugh. I think you guys get the point though by now: I hate football and everything it stands for in this country. I always will and I think Super Bowl is the dumbest sporting event of all time. So, I’m not going to use an entire post this year to wax poetically about my distaste. Instead, let’s wax poetically about these maple wrapped brussels sprouts because they’re way more deserving of the attention than a bunch of padded morons tackling each other on a field. 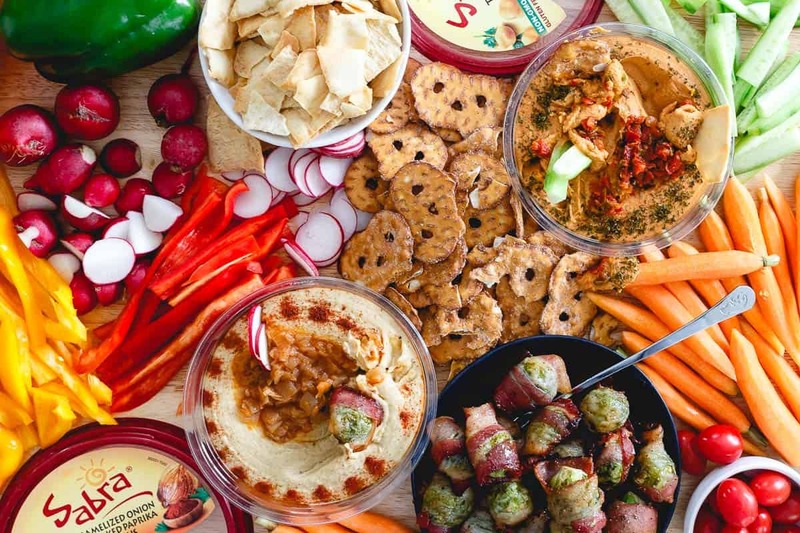 I teamed up with Sabra again this year for some Super Bowl eats inspiration and while their amazingly delicious hummus flavors make it really easy to be a lazy host (seriously, a few cut up veggies and a bag of pita chips is all you really need), I like having something in an appetizer spread that I actually made. Bacon wrapped brussels sprouts are that perfect addition. First of all, they’re a vegetable, right?So you can totally justify them being on this veg heavy spread. Secondly, they have bacon so they instantly become football watching appropriate. And third, if you’re not aimlessly shoving food into your mouth on game day like most of us do and you actually care about the flavors you’re choosing to spend your calories on, the slightly sweet maple glaze on these bacon wrapped brussels sprouts makes them something not only worthwhile of ingesting but interesting to your tastebuds at the same time. 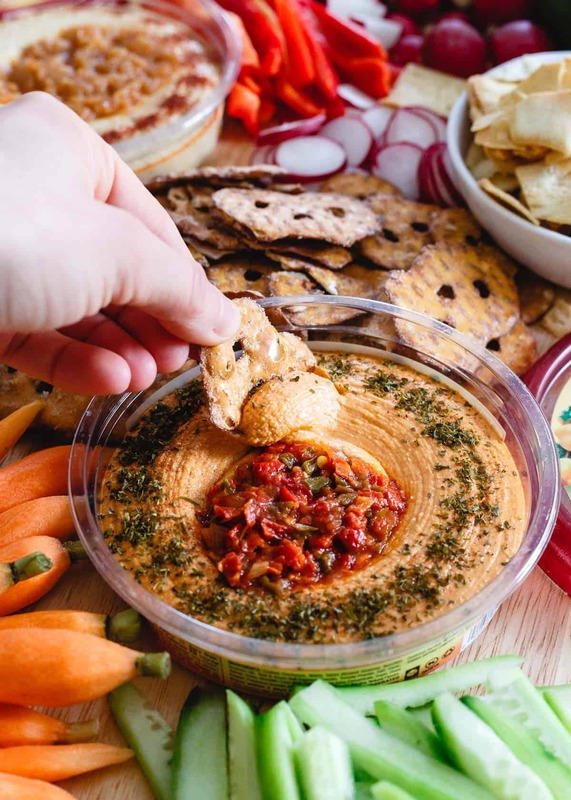 Knowing I was going to have Sabra’s caramelized onion hummus in this spread (it’s my absolute favorite flavor of them all), I didn’t even bother with a sauce or dip for the sprouts. 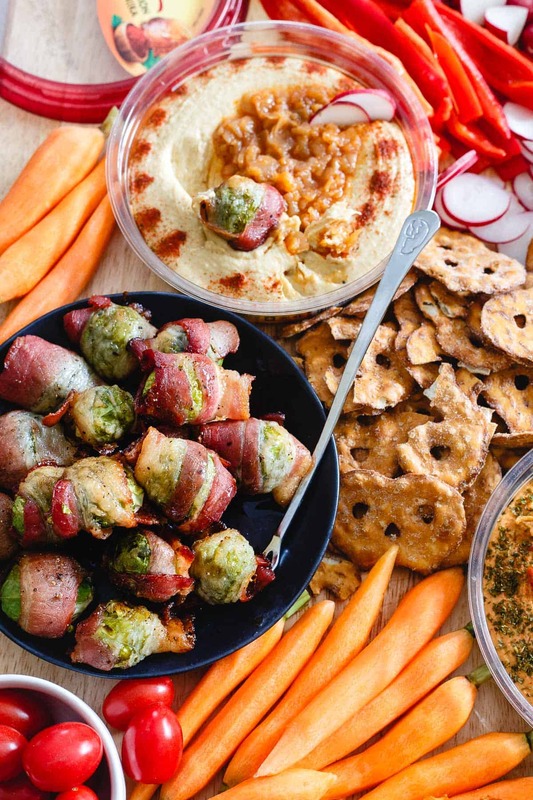 The savory onion flavor from the hummus goes perfectly with that sweet, salty bacon wrapped brussels sprout and of all the things on the table, that combination might be my favorite bite. Of course, there are pita chips, pretzels, lots of veg for good measure and some taco inspired hummus (another great crowd pleaser of a flavor) too. I know game day eats tend to be pizza, slider and wing heavy but I’m betting if you put out a spread like this, you might never even make that takeout call. I’ll once again be in Mexico hopefully poolside in sunny Cabo San Lucas this year for “the” game so fresh guac, tacos and margaritas will likely be my celebratory calories of choice but I hope if you’re at home in front of the tv this spread and these maple wrapped bacon brussels sprouts give you some healthier inspiration for the game! I really love these smashed sweet potato guacamole bites for a game day appetizer too. Use Sabra guacamole to make them even easier! 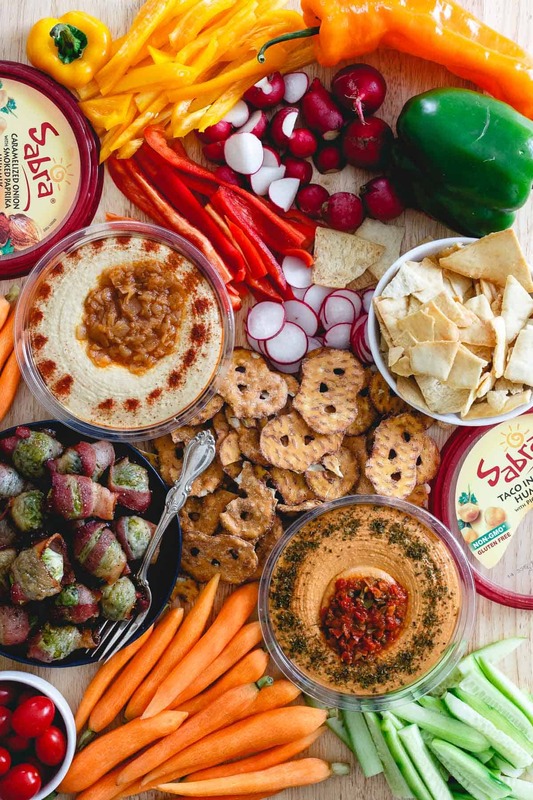 Grab a coupon from Sabra (the Official Dip Sponsor of the NFL) and pick up a tub (or two) for your game day celebration! Love this maple bacon wrapped brussels sprouts recipe? Try other delicious appetizer recipes like: Roasted Garlic White Bean Dip, Roasted Grape and Jalapeno Sweet Potato Crostini, Blueberry Ginger Jam and Goat Cheese Crostini. These bacon wrapped brussels sprouts are glazed with maple syrup for a salty, sweet bite. Serve them as a game-day or any-time party appetizer! Lay bacon strip flat and wrap around a halved brussels sprout so that the ends meet on the flat side. Place brussels sprout on a baking sheet seam side down. Repeat with all the brussels sprouts. Lightly brush the brussels sprouts with the maple syrup. Bake for 25-30 minutes in pre-heated oven until bacon is crispy. What a great idea! And what a super spread! Love these sprouts! Been wanting to give this a try! So creative, so simple yet beautiful ! Thank you so much ! That is such a great combination! I never thought to pair brussels sprouts with hummus. Love it! This spread looks amazing for game day! Loving all the veggies! Thanks for sharing! The food is where it’s really at anyway. I want to dip a few of these Brussels sprouts into that hummus!! Love Brussels sprouts and Sabra dips! My kinda snack. Little secret: while I love game day food, I still can’t figure out football! But that’s ok, since I’ll just hang closer to the table with this amazing spread! Love these savory sprouts and all the hummus!!! I’ve never like brussels sprouts but I figure that anything wrapped in bacon will go down well – this’ll make the to-do list, for sure. Thanks! What a gorgeous spread! Love those maple bacon wrapped Brussels sprouts! These would make for great game day appetizers! I want to dig into this right now!! nicely different appetizer recipe, whether for football (who cares?) or anything else, thank you! Recipes look great, not typical. please keep sending.